There's more to every "I'm leaving you" story. As part of a global partnership Indigenous Media, Microsoft and FOX collaborated to create GONE, A 10-part custom content digital companion series. Running simultaneously to the limited FOX series, Wayward Pines, GONE added an extra layer to the lore of the town's history, seamlessly tying new characters into an already compelling tale. The series ran on a Microsoft branded hub on FOX.com in the US, UK, Germany, Japan, Portugal and Australia (FX). GONE ran on the FOX NOW App within all connected devices, VOD and XBOX 360 Season Pass in the US and on the Wayward Pines GONE custom app in the UK, Germany, Japan, and Australia. GONE was promoted via custom Microsoft Surface branded trailers, which were adapted into local languages across all markets. 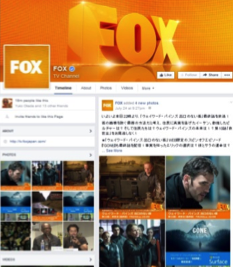 FOX ran a robust social marketing campaign using Indigenous-created assets, including native video clues and tune-in posts across Facebook, Twitter, Instagram and YouTube. GONE received significant viewership across all platforms in all markets.